Who was and wasn't at Egypt's National Dialogue. One of criticisms and suggestions Ayman Nor made before his arrest was that since opposition party presidents and secretary-generals had to meet with the National Democratic Party during Egypt's ongoing National Dialogue discussions that the same should apply to the ruling party. Instead the NDP sends its S-G Safwat al-Sherif and Membership head Kimal al-Shazli. The president of the NDP is, naturally, also president of the republic. You could practically hear al-Sherif scoff at the thought of president Mubarak forced to waste his precious time with these troublesome oppositon parties when Nor made such a request. 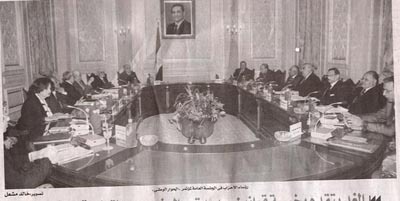 Nevertheless, based off of this picture published in today's al-Misri al-Yom, an argument could be made that the president attended.